Ever since I began all-over moisturising two times a day, I have been careful about the ingredients of body butters and lotions. You don't want to slather all kinds of things all over your skin two times a day, seven days a week, 52 weeks a year. I repeat, all over the skin, everywhere. I have very sensitive skin, and there have been body lotions which haven't been kind to certain tender areas, or lotions that are too gentle for dry weather, making my skin flaky and scaly. The Botanical Splash Body Moisturiser and Revitaliser is a 100% natural body moisturiser containing just pure botanical oils of almond, orange, lime, lemon, olive and avocado. It is free of preservatives, parabens, synthetic chemicals, artificial fragrance, petroleum-based oils, GMOs, colourings and any other additives. The best part is, three lucky people - from Europe, Canada, Australia, the US or the UK ONLY - will receive a bottle each as a New Year gift! 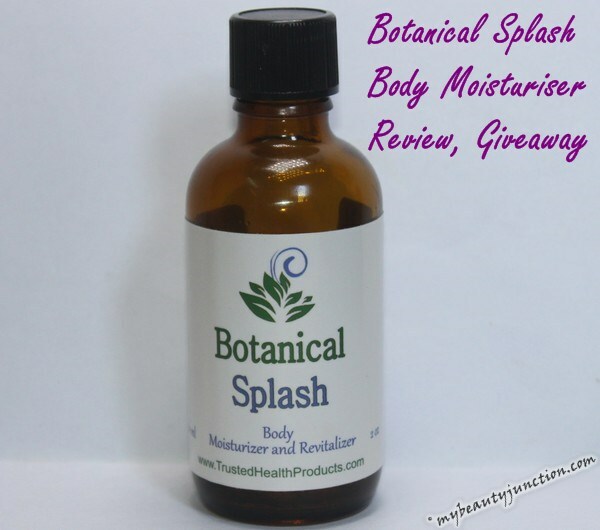 Read on for my review of Botanical Splash Body Moisturiser and Revitaliser. If you read my review of the Beautiful A.M. Moisturiser and P.M. Revitaliser here, you may observe the similarity in packaging. Both are from the same company, Trusted Health Products. The Beautiful set is also 100% natural and I have just finished both bottles and have a well-hydrated, rested and smoother face to show for it. Both come in glass bottles. Careful not to keep these anywhere near your medicine cabinets, especially anywhere close to cough syrup. Combined with the Beautiful set for women, or The Man Moisturiser and Revitaliser set for men, Botanical Splash forms a comprehensive skin care system. Lemon: Natural cleanser which improves the skin's antioxidant properties, thereby preventing damage. Olive: Cleanser, moisturiser, shown to prevent skin cancer cells from spreading. Avocado: Increases soluble collagen content in the skin. Contains vitamins A, D and E.
Formula-wise, Botanical Splash is clear and very runny. A little goes a long way - it spreads out easily and sinks in without greasy residue. The product smells of sweet orange, lemon and bergamot. I apply it after a shower, so only a few drops are needed for each area. I have more than half the 60ml bottle left after five weeks' use. It does not leave any oily marks on my clothes, and is absorbed quickly. Despite the dry weather, my skin is smooth, soft and well-hydrated, and I have not had any breakouts. Definitely one of the best winter moisturisers I have used, and a firm favourite in my skin care regimen. Three winners will receive one bottle of Botanical Splash natural moisturiser each. This giveaway is open ONLY to residents of Canada, Australia, Europe, the US and the UK. This giveaway is null where void. Trusted Health Products has sponsored the prize and will send it to the winners. I only host and facilitate. Please do not enter with multiple accounts or ask me to choose you as a winner. Neither Trusted Health Products nor I will be responsible for customs duties, local taxes, import charges, excise or any surcharges incurred by the winners, or for packages delayed, lost or damaged in the post. I will be announcing the winners within 24 hours after the giveaway ends. Winners must email me their shipping details within 24 hours of being contacted. For a full list of terms and conditions and legal liabilities, please see the T&C section below the Rafflecopter widget. If you cannot see the Rafflecopter widget below, click here. For a limited time, Trusted Health Products will send out a bottle of Botanical Splash to readers of My Beauty Junction for a nominal shipping and handling charge. Click here to get your bottle of Botanical Splash now!